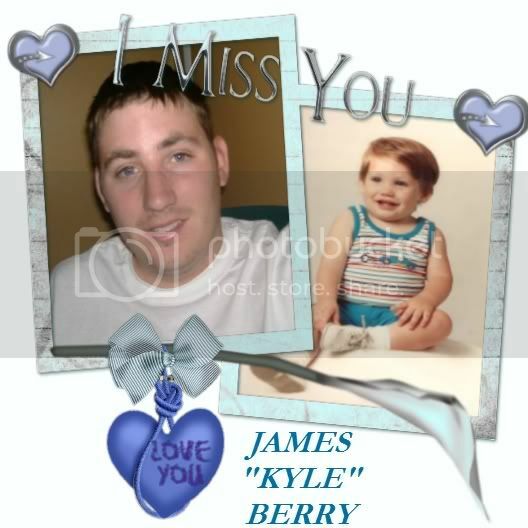 his memorial website was created in the memory of our loved one, James "Kyle" Berry who was born in Arkansas on May 19, 1983 and passed away on May 02, 2006 at the age of 22. We will remember him forever. Kyle was Jim's and my only child, and he is missed by so many...He came into this world fearless and left this world without fear. I never knew how much of an impact he had on others until his death, I knew he had many friends, but never knew he was everyone's best friend. The newness of him being gone is an everyday struggle for his father, friends, family and I. When Kyle was born, he was a whopping 9 lbs. 9 oz, with a full head of hair. Through his toddler years he never stopped moving and curious about anybody and everything that was around him. He was a good baby, slept sometimes up to 12 hours during the night, and when he napped he slept for almost two hours. But when he was awake, you knew it, and you couldn't look away for a second or he would be in the dishwasher or climbing the furniture. We later learned he had ADHD when he began school, and it caused alot of worries trying to keep him on task and concentrate to get him through. We realized college wasn't in his plans, but we also knew he was gifted in other things. He had a natural golf swing, and played in junior tournaments, and even had 2 hole in ones. He was fascinated with cars, 4 wheelers and motorcycles, and learned how to work on them with his friends. Last June his girlfriend of three years and him decided to move to Orlando so Kyle could attend Motorcycle Mechanic Institute. This had been a dream for Kyle for quite sometime, he loved motorcycles and loved to work on them. With the strain of being away from all his friends in Arkansas, him and his girlfriend went in different directions, Kyle decided to take a break from school and go back home to see his friends and get his mind off it all. He seemed happier around his friends, and they were all glad to be around him. Kyle especially, he didn't have any head trauma, but his pelvis was busted up and he had massive internal bleeding. I will miss my baby so very much, every inch of his 6'3" frame, his massive hands and feet, the way he would always tease me and try to get me irritated when I was trying to do something, him texting me, calling me late at night because he wasn't paying attention to the time. I LOVE YOU SWEET KYLE BOY!!! I want all of you to know how much I appreciate you going to Kyle's "My Space"
share a story or even send a picture that you would want to put on his page. I love all of you and would love to hear from you any time. No time to say "Goodbye"
Once in a little pond, in the muddy water under the lily pads, there lived a little water beetle in a community of water beetles. They lived a simple and comfortable life in the pond with few disturbances and interruptions. Once in a while, sadness would come in the community when one of their fellow beetles would climb the stem of a lily pad and would never be seen again. They knew when this happened, their friend was gone forever. Then, one day, a little water beetle felt an irrisistable urge to climb up that stem. However, he was determined that he would not leave forever. He would come back and tell his friends what he had found at the top. So, fly he did! And as he soared he saw the beauty of a whole new world and a far superior way of life to what he had never known existed. Then he remembered his beetle friends and how they were thinking by now he was gone forever. He wanted to go back to tell them, and explain to them that he was now more alive than he had ever been before. His life had been fulfilled rather than ended. IN HEAVEN FAR ABOVE, AND THAT I'D HAVE TO LEAVE BEHIND ALL THOSE I DEARLY LOVE. REMEMBER TO TELL THE ONES YOU LOVE THAT YOU CARE!!! Somedays my shoes hurt so bad that I do not think I can take another step. Some women/men are like me and ache daily as they try and walk in them. No woman/man deserves to wear these shoes. Yet because of the shoes I am a stronger woman/man. I will forever walk in the shoes of a woman/man who has lost a child. love leaves a memory no one can steal!!! Love you my precious son!! But also legacy can apply to other things in someone's life, and saying that, I can describe what qualities Kyle had in his mother's eyes, and also from what others have said about my baby. encouragements from his soul to help that person..There's no better legacy than that. This memorial website was created by Valerie Berry (Patton) on 06/12/2006. Philip Patton lit a candle on 09/09/2016: "Thought I would tell you we love ya and still talk about ya everyday,I love your mom to death but you already know that"
Jo-Ann Pacenta Lauren's Mom lit a candle on 06/21/2014: "In Loving Memory - this light shines in honor of your life and the love you shared with family & friends~♥~"
Mom (hi Honey) lit a candle on 01/22/2014: "There is not a day that goes by that I don't think about you son! Love you!" Jo-Ann Pacenta Lauren's Mom lit a candle on 12/16/2013: "Wishing you a gentle, blessed holiday season, filled with those special memories that bring smiles to your hearts ~♥~"
Frank McIlroy lit a candle on 11/20/2013: "Valerie, My prayers are with you, your family, and Jim. I'm so sorry. I didn't know." MOM lit a candle on 11/05/2013: "7 YRS..I MISS YOU AND LOVE YOU SO MUCH!" Terry SMJ lit a candle on 05/04/2013: "Thinking of you with both Kyle's dates this month. Sending hugs & love, Terry (WebH)"
Deb Huntley lit a candle on 05/02/2013: "Kyle is Forever loved, and forever missed by many, thinking of you today. Kyle please send your mom a sign today." PHILIP PATTON lit a candle on 05/02/2013: "MISS YA KYLE,SHOW YOU MOM A SIGN TODAY AS YOU ALWAYS DO..LOVE YA"
Jo-Ann Pacenta Lauren's Mom lit a candle on 03/10/2013: "Those we love don't go away, They walk beside us every day, Always near, Still loved, still missed & very dear"